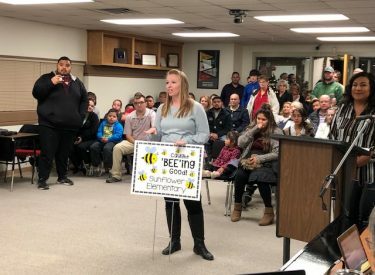 It was a packed house at the recent meeting of the USD 480 Board of Education as numerous teachers and students were celebrated for their accomplishments. The Liberal Chamber of Commerce recognized the December Teacher of the Month, Miss Jodie King, a preK teacher at Bright Start Early Learning Center. Sunflower students and teachers shared with the Board the “Caught Ya “Bee”ing Good” positive recognition initiative. Members of the Fargo Masonic group also announced the winners of the Fall 2018 Exemplary Student and Teacher Award. One student and one teacher from each building were recognized by the Masons for their contributions to our community and leadership at their schools. Reports from the district directors updated the BOE on the Redesign process and various ongoing construction projects throughout the district. Also, the Liberal City Manager, staff, and three city commissioners offered a proposal for the use of the former South Middle School building as a shared endeavor. In new business, the board approved the financial audit for the 17-18 school year from Hay Rice & Associates, approved the LHS gyms to be open on Sunday afternoons through basketball season, and several information only items including the proposed 19-20 school calendar.